Sergeant Macaulay Park is one of only a few playgrounds in San Francisco’s Tenderloin neighborhood. 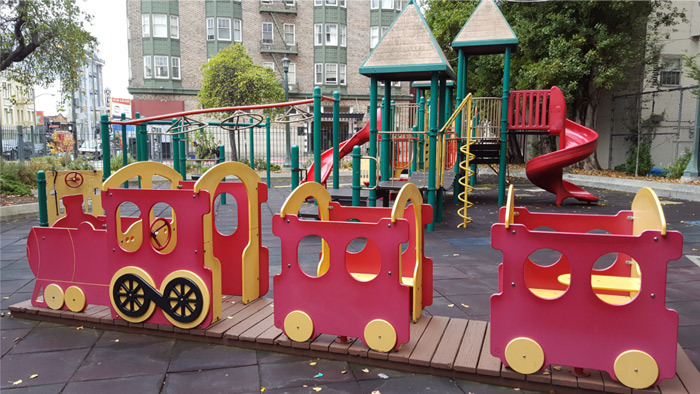 The park serves as an important resource for the many children and families living in the Tenderloin, but was recently ranked in the bottom 6 of all 135 playgrounds in San Francisco. A diverse population of nearly 40,000 people live within a 10-minute walk of Sergeant Macaulay Park. With only 12 acres of park space, there is less than one acre per 3,000 residents of the Tenderloin. The Trust for Public Land is working with San Francisco Recreation and Parks Department to engage the community in a participatory design process. The renovation will be anchored in the context of existing recreational facilities and programs within the Tenderloin.